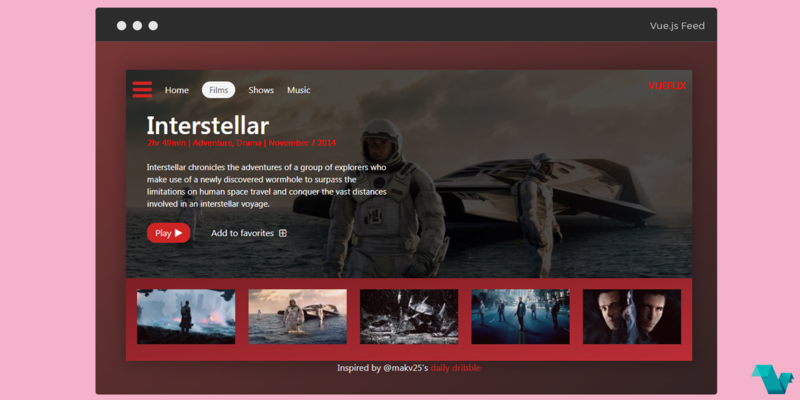 Almost everyone is familiar with streaming services such as Netflix, and now you can follow a tutorial to build a similar interface using Vue.js This tutorial, Building a movie app interface with Vue.js, is about using the common concepts of Vue.js to build a movie app interface. The final result is available in a pen, check it out below. Though Bulma was used as the CSS framework for my application, this post will focus primarily on the usage of Vue.js and will glance over any styling/CSS. If you wish to tag along, I’ve set up a starting pen that has all the custom SCSS, the initial data object and the necessary external CDN libraries (vue-router, etc.). Created & submitted by Hassan Djirdeh.